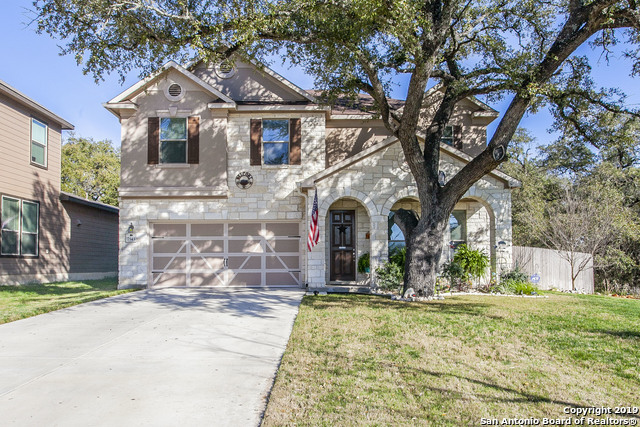 All Cobblestone homes currently listed for sale in San Antonio as of 04/26/2019 are shown below. You can change the search criteria at any time by pressing the 'Change Search' button below. "This gorgeous, meticulously maintained two-story home is located in a desirable gated community! From the open-concept kitchen and living space to the large shaded back porch with 4 sunshades and a TV! There is plenty of room for the whole family to enjoy. Home is equipped with a security system and includes automatic sprinklers. With current solar panels sellers pays $0 in electricity, which is no wonder why they would like to keep them. Sellers are willing to negotiate to keep panels in place"
"Brand new 2-story home in a gated community in Cobblestone! This home has a master suite down, guest suite upstairs, study, open floor concept plan, game room upstairs, covered patio on the green belt. A must see & must have!!!" "100% TURN KEY/MOVE IN READY!!! Like new, Gorgeous 2sty, 4BR, 2.5 bath home with TONS of upgrades. 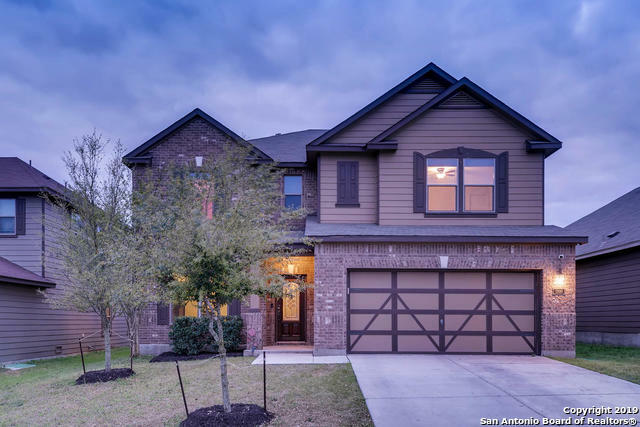 High ceilings, open F/P, can lighting, beautiful kitchen w/island & breakfast bar, eatin kitchen, Granite counter tops, 42Cabinets, tons of cntr space, stone backsplash, sink is plumbed for reverse osmosis. 18C tile, wood, and carpet flooring. Study and master suite have French Doors. GINORMOUS master BR/closet/and walk-in shower.Dual vanities, private toilet. THIS IS AN AMAZING HOME! Schedule tod"
"Brand new 2-story home in a gated community of Cobblestone! This home has a master suite down stairs, study, open concept floor plan, game room up stairs, covered patio on the green belt. A must see & must have!!!" "Single Story 3 Bedroom 2 Bath Plus Study in Gated Community! Features include an Open Layout, with a spacious island kitchen, granite counters, 42 cabinets, gas cooking with stainless appliances. Huge Island features bar seating and sink that faces living area. Ceramic Faux Wood Tile Throughout with Carpeting in Bedrooms and high ceilings make this home comfortable for all! Enjoy your covered back patio. Community Pool, Sports Court, Park. Convenient Access to Shopping, Dining, Schools, and Ente"
"5 bed, 3 bath, 2-story, Cul-de-sac in gated Cobblestone. 1st level: wood-like ceramic tile, open-concept kitchen w/silestone quartz counters, 5 burner gas stove, double/convection oven, ample cabinets/storage that feeds into Dining & living space. Formal dining/flex space- office/playroom. Master & 2nd bedroom on FIRST level. 2nd level: loft & 3 bedrooms w/a double vanity bath. Extended driveway. Water softener & sprinkler system; Oversized Covered back patio. Amenities - pool, park, playground,"
"Brand new 1-story in Cobblestone. This home is 3 beds/2 baths, study & game room. The home is on a greenbelt & has a covered patio for spending time with the family & guests. Gated community & NISD schools! Come on out & see for yourself." "Located in a gated community is this beautiful 2stry, 4BR, 2.5 bath home with 9' high ceilings,and O/F plan. Kitchen has TONS of counter space, breakfast bar, eat-in kitchen area, granite counter tops 42 cabinets, canned lighting, S/S appliances w/gas stove. Master suite on main level with ensuite bath, dual vanities, garden tub with separate shower, HUGE walkin closet. Upstairs has remaining bedrooms with a GREAT size game room. Backyard deck provides a great area for entertaining. Schedule to"
"Brand new 1-story home in Cobblestone! This home has 4 bedrooms, 2 baths & study. The home is on the greenbelt & has covered patio for spending time with family & guests. Gated community & NISD schools! Come out & see for yourself!!!" "Welcome Home! 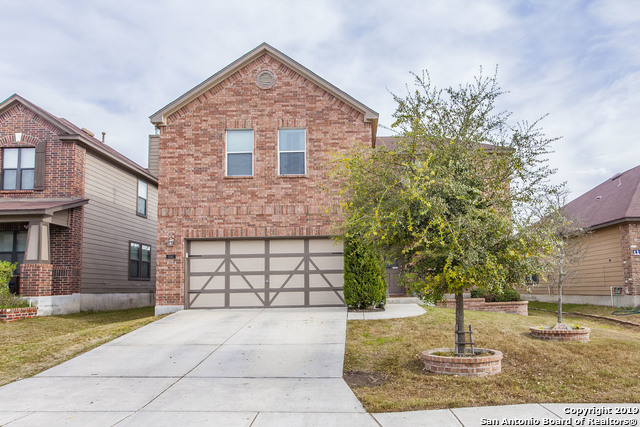 A ready to move in 4 bedroom 2 bath in a peaceful gated community just outside 1604 with the convenience of shopping within 5 minutes . All bedrooms are upstairs in this beauty, which leaves the main level to entertain your family!. Back yard is perfect size to add an extended patio or swimming pool, if not, you are 2 blocks away from the community center which features pool, basketball court & park. Come & take a look!." "Brand new construction on this one story beauty in Cobblestone. This home has 3 beds / 2 baths and has an open floor plan and lots of storage space. The kitchen has stainless steel appliances, and luxury vinyl plank flooring. A covered patio for back yard entertaining. NISD schools. Come out and take a look!!" "Brand new construction in Cobblestone. This home is a one story with 3 beds/ 2 baths and an open floor plan. The stunning kitchen has 42 cabinets, stainless steel appliances, and granite counter tops. The master bath has a walk in shower. This home has a covered patio and it sits on a greenbelt. NISD schools. No city taxes!! Come out and take a look!!" "Beautiful brand new construction on this one story. This home has 3 beds/ 2 baths. Open floor plan and lots of room for storage. Stainless steel appliances in the kitchen and luxury vinyl flooring. Beautiful amenity, center pool, basketball, and tennis court, NISD schools. Come out and take a look!!"